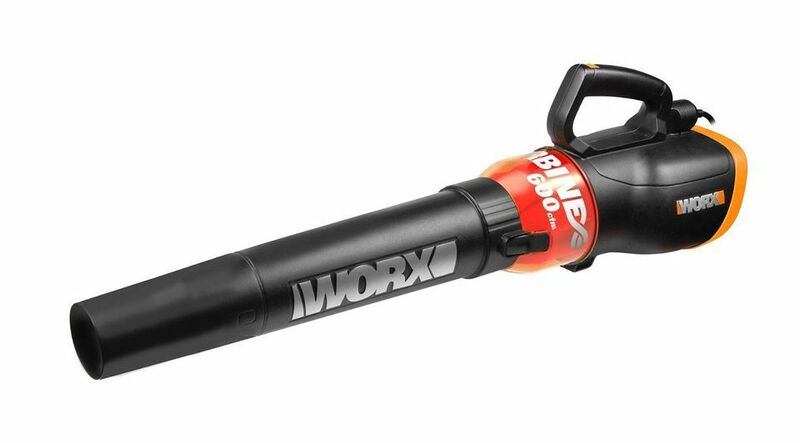 For a blower that delivers on-demand air flow at three different speeds and is easy to use and comfortable to carry, it’s hard to beat the Worx Turbine Corded Leaf Blower. With a corded electric leaf blower, you won’t need to worry about battery life cutting off the wind power of this machine. The Worx Turbine model plugs into an extension cord and delivers air at speeds up to 110 miles per hour. More surprisingly, though, is the fact that this leaf blower moves air at an impressive 600 CFM—which is enough to corral even wet leaves and gravel. The three speed options let you choose between low, medium, and high operation. On low, people report that the blower is relatively quiet. However, the noise volume increases significantly on high, which is to be expected for a unit with this much power. This popular model of leaf blower has been the star of online videos testing its power (including its impressive ability to move a brick) and has earned over 1,000 rave reviews. Despite being so powerful, people find it reasonably light and easy to carry around since it only weighs 6.4 pounds. The only thing to consider is the fact that the force of so much air being pushed through the unit can fatigue your arm—so it may be necessary to switch hands every so often while using this blower. Overall, the Worx Turbine Corded Leaf Blower has plenty of power to rival many gas-powered leaf blowers without the fuel or fumes. With three-speed options and an output of 600 CFM, this model makes a great choice for a durable, functional leaf blower. Roam free chasing down rogue leaves and stray debris with a cordless leaf blower. The 56-volt Ego Turbo is our top pick for a cordless leaf blower that packs serious power. The Ego Turbo is equipped with a 2.5Ah lithium-ion battery that runs for close to an hour in regular operation and about 20 minutes in turbo mode. Inside the unit, a brushless motor reduces friction and increases the durability of this blower. Weighing in at 9.8 pounds, it certainly isn’t the lightest leaf blower on the market, but this hasn’t stopped it from becoming one of the most popular cordless models. More than 3,000 people have rated this model 4 stars or higher. As for power, this cordless leaf blower offers plenty. It has top speeds of up to 110 miles per hour and a respectable 530 CFM. While some reviewers wish the battery lasted longer in its max mode—since that offers the most efficient clearing ability—most people are satisfied with the Ego Turbo’s battery life, power, and performance. If you’re looking for the convenience of a cordless blower in a light-as-a-feather package, the Worx Cordless Hi-Capacity Blower is our recommendation. Weighing in at less 4 pounds for the blower itself, this lightweight leaf blower is easy to tote around when cleaning out the garage, shed, patio, and more. While the 80 CFM isn’t a great match for moving larger debris, people report that it’s great for removing leaves, pine needles, sand, and more off paved surfaces. This lightweight blower is also a good option for those with mobility or weight limitations that make it tough to lift heavier models of leaf blowers. The Worx Cordless Hi-Capacity Blower is so light that one person compared operating it to waving a book around—just with better results. The included 20-volt battery lasts for somewhere between 15 and 20 minutes in real-world use, which is about on par with leaf blowers in this size category. It may not be enough to tackle serious square footage, but it’s definitely enough battery life to clean your garage floor or give the front of your home a quick touch-up. A gas leaf blower offers plenty of power and no limitations when it comes to battery life or cord length. Instead, these leaf blowers depend on fuel and regular maintenance to keep up peak performance season after season. The Ryobi Gas Jet Fan Blower is a solid choice for a handheld gas blower. This leaf blower is powered by a 25cc gasoline motor and a 3-stage fan system that gives more wind power and speed. The speed itself is variable, with a ‘cruise control’ option that lets you set the airspeed to one of three settings. Despite having a large opening at the end of the blower, users have found that it’s easy to direct air flow and that this blower is reasonably precise for its size. With top speeds of 160 miles per hour and 520 CFM, there is plenty of air to remove everything from leaves and sticks to dirt and gravel. Weighing in at just under 10 pounds, this gas leaf blower is heavier than its electric counterparts – but the included shoulder strap helps to distribute the weight, according to users. If you want to cut the cord and skip boosting batteries, this gas leaf blower from Ryobi is a smart choice for extended yard work sessions. Instead of blowing leaves every which direction, the Toro Ultra gives you the option to vacuum and mulch leaves in one easy step. If you’re shopping for a leaf vacuum, the Toro Ultra is a model you don’t want to miss. Capable of being operated in both blower and leaf vacuum mode, the Toro Ultra can move air up to 350 CFM. It also offers a variable speed setting, giving you more or less wind power (up to 250 miles per hour) depending on the task. In leaf vacuum mode, this corded device will suction up leaves before mulching the majority to less than a ½ inch in size. While some leaf vacuums use plastic components, it’s worth pointing out that this model has a more durable metal impeller. The debris bag has a zippered closure that makes it easy to empty mulched leaves when your work is done—just be careful not to let the bag drag on rough terrain. A few people experienced holes or zipper failures after letting the bag drag around behind the leaf vacuum. One related complaint is that the replacement cost for a debris bag is about $30—almost half the cost of this leaf vacuum. However, for a powerful leaf vacuum that offers the versatility of a blower, the Toro Ultra is our top pick for convenience and value. Some rechargeable leaf blowers fall short in delivering power and performance, but not so with the Greenworks Pro Cordless Blower. This 80-volt leaf blower is powered by a rechargeable 2.0Ah lithium-ion battery. It gives you up to 125 miles per hour of airflow and has multiple speed settings to give you more or less blowing power. The 500 CFM is a little lower than some other blowers in this mid-range class of leaf blowers, but there are very few complaints regarding the power or limitations of this Greenworks Pro Blower. For an electric leaf blower, this unit is on the heavy side at nearly 10 pounds and a few people say the bulk of the weight comes from the battery in the back, which leaves it feeling a little unbalanced. While the manufacturer claims up to 70 minutes of run time on a fully charged battery, there is some debate on how long the battery lasts in real-world use. Most people find it to still have battery power after several 20-minute clean-up sessions, though a few people complain that the battery dies after only about 15 minutes. On the plus side, the battery charges in only about 30 minutes, meaning you’ll be back up and running fast if you do need to pause for a recharge. One other thing that people like about this rechargeable leaf blower is its quiet operation. Of course it’s not silent, but its 60 decibel sound rating (on low) is a far cry from the noisy operation of gas-powered leaf blowers. If you have a lot of ground to cover or you want an easier way to tote around a leaf blower, a backpack model can make the task more manageable. The Echo Gas Backpack Leaf Blower is a popular and reliable choice. Featuring a 2-cycle engine and convenient variable speed throttle on the blower tube, this leaf blower gives you whopping speeds up to 215 miles per hour and 510 CFM. It works great for both commercial and residential use, and you can spot professional landscapers and homeowners alike sporting this backpack leaf blower. Reviewers consistently comment on how easy it is to use this Echo leaf blower and they love the power and performance. The only complaint, which isn’t uncommon with backpack blowers, is the fact that you can’t restart the blower without taking it off. And while the backpack design distributes weight to the shoulders and back, it weighs 22 pounds and can start to feel heavy after extended clean up sessions. Still, if you have a large yard or need a commercial-grade leaf blower, the Echo Backpack Leaf Blower makes a great choice. Instead of carrying around a leaf blower or strapping one to your back, a leaf blower with wheels offers an easy-to-maneuver alternative. While these used to be primarily limited to larger, commercial grade units, leaf blowers with wheels for residential use are becoming available—like this model from Ryobi. The Ryobi Gas Walk-Behind Blower has an onboard 42cc gas engine and a powerful fan capable of moving air up to 520 CFM. A variable speed control is positioned on the handle and lets you speed up or slow down to concentrate on areas with more debris. An air discharge tube sends leaves, dirt, twigs and more flying, but know that the tube isn’t adjustable—so it only blows in one direction. Many people that have large yards or a lot of leaf blowing to do find this blower with wheels to be more convenient and easier to use. Instead of needing to carry a leaf blower in hand or on your back, you can easily wheel this leaf blower wherever you need to go. Priced somewhere between a mid-range handheld gas leaf blower and an entry-level gas backpack blower, this leaf blower with wheels is a great value in comparison to the pricier industrial-grade wheeled leaf blowers. Despite the more affordable price tag, it has drawn favorable comparisons to much more expensive walk behind leaf blowers. Blast leaves without blowing your budget by picking up the affordable Greenworks 7 Amp Electric Blower. This inexpensive leaf blower isn’t the mightiest machine but can clean light debris in a hurry. This 7-amp leaf blower offers air speeds up to 160 miles per hour but the 150 CFM rating is low in comparison to more robust models. Still, people love this budget leaf blower for what it is – a quick and handy way to clean leaves, dirt, and sticks off your porch or driveway. Users find that it seems to work best on solid surfaces like concrete, asphalt, or decking, but it’s worth noting that some people have had success using it to clear their lawn of leaves. It may not do the job as fast as other models of leaf blowers, but it weighs less than 5 pounds and plugs into your basic home extension cord (not included with purchase). Save yourself the time spent sweeping or raking and pick up this budget leaf blower from Greenworks. Our writers spent three hours researching the most popular leaf blowers on the market. Before making their final recommendations, they considered 11 different leaf blowers overall, screened options from seven different brands and manufacturers, and read over 100 user reviews (both positive and negative). All of this research adds up to recommendations you can trust. We bought and tested a top-rated leaf blower. Our reviewers spent two hours using it to blow away leaves and debris in their own yards. We asked our testers to consider the most important features when using this leaf blower, from power to weight and ease of use. We've outlined the key points so that you, too, know what to look for when shopping. Power source Most leaf blowers today are either gas powered or electric, and electric options come in both corded and cordless designs. Gas-powered options are typically more powerful, but they’re also louder and require more maintenance. Corded products are quieter, but less powerful, and you’re restricted by their cord length. Finally, cordless leaf blowers are incredibly portable, but they have a limited run time. Yard size The size of your yard will play a big role in which leaf blower you ultimately choose. Larger yards will require more power, and you’ll probably want a cordless option for unlimited mobility. Smaller yards, on the other hand, can generally be cleared with a less powerful product. Weight Don’t forget to consider the weight of the leaf blower when making your purchase. Gas-powered products tend to be heavier than electric options, and if you don’t think you can hold the unit up for extended periods of time, you may want to consider a backpack-style blower.